Kennedy Space Center has recently created a photo album collecting their photos from the clean rooms where technicians are working madly to prepare the Curiosity Mars rover for launch. The most recent photos, taken on September 23 (so more than two weeks old now!) show the backshell being stacked on top of the folded rover and descent stage. 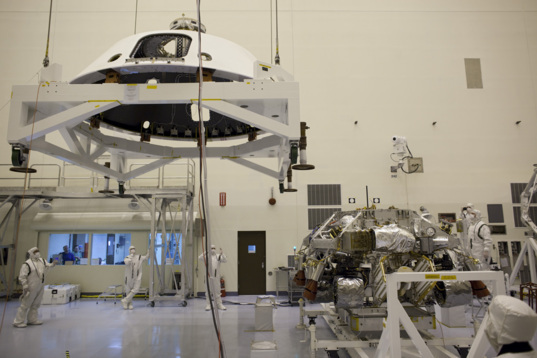 The backshell is the bit that protects the top side of the spacecraft during its entry into Mars' atmosphere, and contains the parachute; it will be jettisoned along with the parachute just before the descent stage rockets start firing near the end of the landing process. 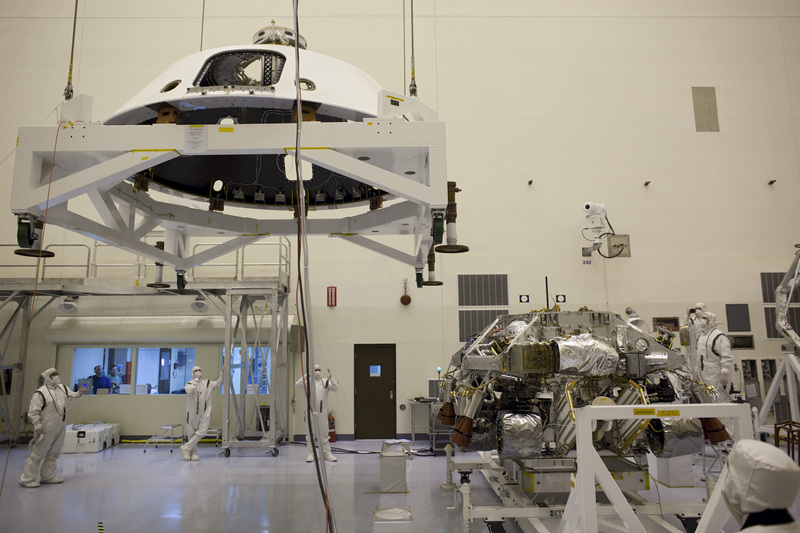 In the Payload Hazardous Servicing Facility at NASA's Kennedy Space Center in Florida, technicians, using an overhead crane, lift the backshell for NASA's Mars Science Laboratory (MSL) rover, Curiosity. The backshell, a protective cover which carries the parachute and several components used during later stages of entry, descent and landing, will be encapsulated over the rover (seen to the right). A United Launch Alliance Atlas V-541 configuration will be used to loft MSL into space. The MMRTG won't be installed until just a couple of days before the launch, because it throws off so much heat. 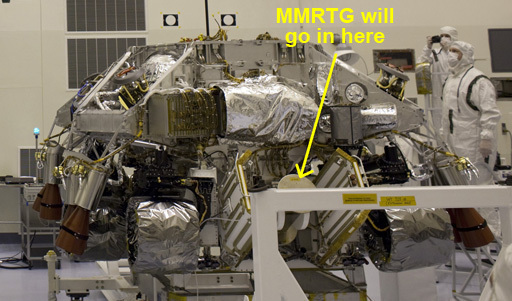 Once the rover has launched, a cooling system will vent the excess heat to space, but between now and then it takes a pretty powerful cooling system to keep the MMRTG from heating up the interior of the spacecraft to hazardous levels. I was told a while ago that they have three redundant cooling systems working to keep the spacecraft at a safe temperature between MMRTG installation and launch. So where is the MMRTG now? Below is a photo from June 30 showing it being decanted from its transport cask, which also was outfitted with cooling systems. The photo captions to other images from that date state that it's safe to have it exposed without supplemental cooling systems in the large open space of the high bay -- the space is so large that the high bay's usual ventilation system is capable of dealing with the added heat. In the high bay of the RTG storage facility at NASA's Kennedy Space Center in Florida, a Department of Energy contractor employee guides the external and internal protective layers of the shipping cask as they are lifted from around the multi-mission radioisotope thermoelectric generator (MMRTG) for NASA's Mars Science Laboratory mission. The MMRTG no longer needs supplemental cooling since any excess heat generated can dissipate into the air in the high bay. 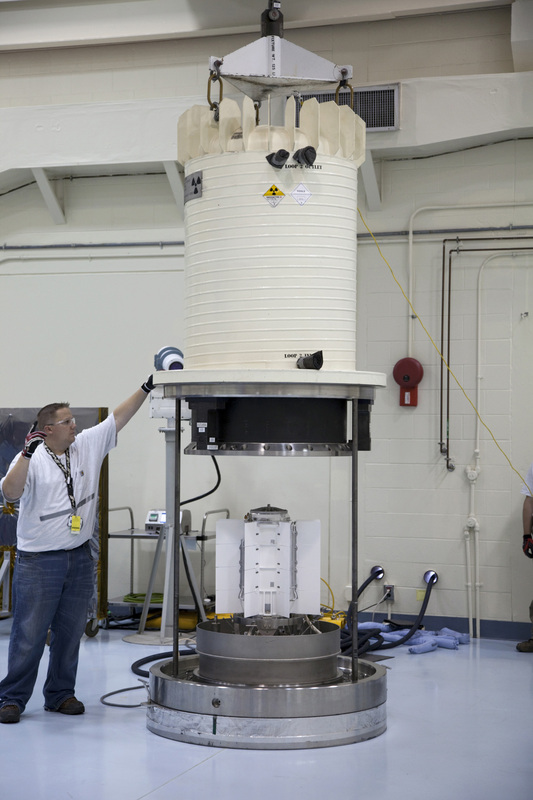 The MMRTG will generate the power needed for the mission from the natural decay of plutonium-238, a non-weapons-grade form of the radioisotope. Heat given off by this natural decay will provide constant power through the day and night during all seasons. Waste heat from the MMRTG will be circulated throughout the rover system to keep instruments, computers, mechanical devices and communications systems within their operating temperature ranges. It's amazing how small this device is, and how much it looks like some imagined thermonuclear sabotage device from a science fiction movie. 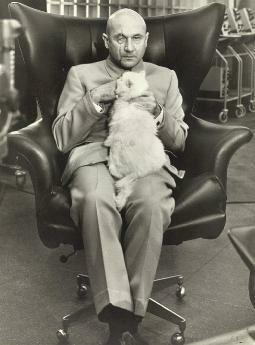 It's not hard to imagine the supervillain Ernst Stavro Blofeld from the James Bond movies plotting to send black-clad ninja superthieves to Florida to steal it, and to use it to hold the world hostage, demanding a billion-dollar ransom! "I shall look forward personally to exterminating you, Mr. Bond."